I already had knowledge of Jan’s life and her tragedies before we were actually introduced. She had lost both her husband and daughter to cancer within less then three years. Her name was known to me as someone who had suffered great heartbreak. When we first met, I was surprised at the peace she had within her. I had just lost my 17 year old daughter, Maggie to suicide. I was most probably still in that numbing stage of early grief. The shock we all wish we could return to, as it is a protection of our emotions. Shock feels like being in a fog and it is the body’s way of protecting us from the initial pain. This peace surrounding Jan was like a navigation map for me and set me on my journey of difficult and complex healing. As time progressed, our friendship grew and I felt touched by the joy that Jan was able to find amidst great sorrow. In stark contrast were some other mothers I was beginning to meet. They were suffering the loss of a child as well, but dealt with it so differently. Jan did not allow her sorrow to overtake her, drag her under nor did she let it define her. Jan never used her tremendous losses to gain attention. Nor did she allow herself to be defined as a victim. I believe God placed Jan in my life as a guide, so to speak. I met Jan in the fall of 2011, about one month after my daughter’s tragic death. I was well aware of Jan, as we both served as Stephen Ministers (at different times) at our church. Stephen Ministry is a one-to-one lay caring ministry which provides confidential care to those who are hurting. We prayed for Jan as she and her husband moved to Chicago to care for their very ill daughter Tina. For two years we prayed weekly for Jan and although I had never met her, I felt a bond with her. I had no idea I would lose my Maggie and of the deep darkness I would walk through, yet my heart broke for Jan. She was doing everything in her power to help her daughter, as well as her young grandson and son-in-law. 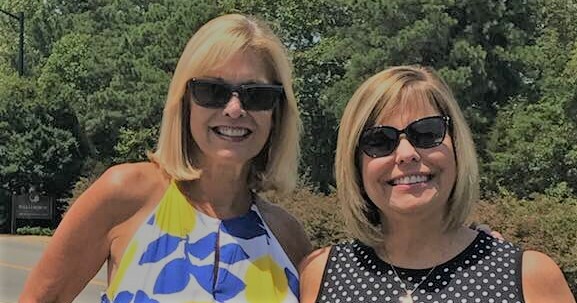 During our weekly Stephen Ministry meetings, I would learn that Jan’s daughter Tina had lost her battle with ovarian cancer. I would later learn that Jan’s husband Toby, had been diagnosed with mesothelioma. Much prayer was prayed for Jan. The power of prayer is a mystery. It cannot be explained. We have been given the choice to either embrace it or simply leave it alone. I firmly believe in prayer, but also believe that what we fervently pray for may not be what is answered. In a little over two years, Jan lost both Tina and Toby. You may be familiar with the saying “Beauty from the Ashes” and it can be comprehended in different ways. I see it as joyous blessings for the mourning. It is finding something lovely to dwell upon instead of the pain. Whenever grief tries to steal the beauty of your memories… just remember that love never dies! My friendship with Jan is one of the most beautiful gifts I have received since losing my Maggie. Our now seven year old friendship has bloomed into a joyful and lovely bond. I gleaned from the manner in which Jan dealt with her grief head on. I am grateful that she was such an inspiring example to me in my own journey of loss, pain, forgiveness and finally acceptance. I write to heal and to better comprehend my life and it’s meaning. Through the sudden, shocking and devastating death of my 17 year old daughter, I have finally found my voice. My stories are of a peace that stands stark against the circumstances of my life and of a hope that never lets go. I trust God’s grace can be seen in both triumph and tragedy.